Mucosa associated lymphoid tissue lymphoma translocation gene 1 (MALT1) is found in extranodal low-grade B cell lymphomas. Jurkat, Daudi or HeLa cells. Tonsil or lymphoma. 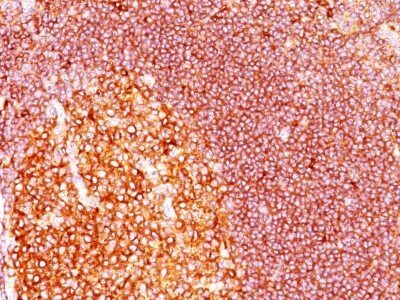 Mucosa associated lymphoid tissue lymphoma translocation gene 1 (MALT1) is found in extranodal low-grade B cell lymphomas. MALT1 encodes two Ig-like C2-type domains and fuses with an API2 gene, which is highly expressed in adult lymphoid tissue. The translocation of this MALT1 gene, which maps to human chromosome 18q21, and the apoptosis-inhibiting API2 gene results in an increased development of MALT lymphomas and apoptosis inhibition. Sites at which this API2-MALT1 (11;18)(q21;q21) translocation commonly occurs are within human lung and kidney tissue. MALT lymphoma expresses nuclear Bcl10, which mediates the oligomerization and activation of a MALT1 caspase-like domain. MALT1 mRNA is found in pre-B cells, mature B cells and plasma cells. Catalog number key for antibody number 0410, Anti-MALT-1 (MT1/410) The prefix indicates conjugation, followed by the antibody number and size suffix.